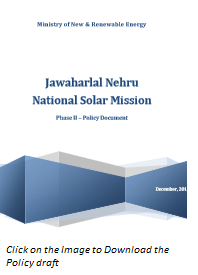 The Ministry of New and Renewable Energy has released the draft policy for Phase 2 of the Jawaharlal Nehru National Solar Mission, popularly known as "JNNSM". JNNSM Phase 2 targets an installation of around 10 GW utility scale solar projects and 1 GW off-grid solar power projects by it's end. Indian Government's Twelfth five year plan starting from 2012-17 also targets a capacity grid connected Solar power addition of 10 GW, and of this 10 GW target, 4 GW would fall under the central scheme and the remaining 6 GW under various State specific schemes. - Phase-II is not entirely dependent on bundling scheme to bring the costs down, as the target capacity under phase- II is high and without confirmation on availability of unallocated quota with central generating stations. - Implementation of Phase-II will have to be reply upon combination of various schemes like Generation Based Incentive (GBI), Viability Gap Funding (VGF) and Bundling schemes. - Witnessing steep fall in tariff discovered under phase-I, Phase-II is expected to achieve new heights of success while achieving the grid parity before 2017. - Developing more clusters of Solar parks. - Roof Top Grid Connected systems will also be given high priority. - Energy Access: During Phase-II, it envisaged that around 20,000 villages/hamlets/basti/padas shall be covered through ‘Energy Access’ scheme by way of deployment of Off-Grid electricity generation projects. - Off grid lighting systems: Deployment Target of 10 Lakh (1 Million) off grid lighting systems. - Solar Cities: Phase II of JNNSM would focus on development of solar cities and also leads to inclusion of more number of cities. - Solar Water Pumping: Deployment target of 25000 solar pumps. - Telecom Towers: Plans to formulate developing special schemes which promote the use of solar telecom towers and would target around 25000 solar integrated telecom towers. - Solar Water Heating Systems: Phase II would target at-least 15-20 cities where solar water heaters would become the main source of heating water replacing electric geysers. Keeping into consideration the good progress in Phase I, Phase II would target around 8 million sq.m. of collector area by the end of 2017.